Now let’s talk about the first configuration known as the single phase. This is basically the type that we have already talked about. You will have a single input and output as well as a single throat to restrict the flow of the air. This single set will only constrict the air once. As you might have already imagined, this isn’t so efficient and doesn’t provide a lot of control over the flow of the air and, therefore, creation of the vacuum. 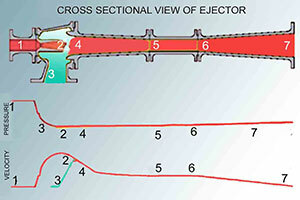 The most commonly found vacuum ejectors will be single phased. Multiphase best vacuum ejectors are, well, multiphase. As their name suggests, they have multiple phases and can be thought of as containing multiple single phases. To put it simply, a multiphase has 2, 3 (or more) single phase vacuum generator sections connected from end to end. Multiphase, obviously, provide a lot more control over the vacuum generation process because the air can be restricted and, therefore, controlled multiple times. This also means that the multiphase are way more efficient than the single phase vacuum generator. Vacuum ejectors are fairly simple and are very efficient at what they are designed for. Unfortunately not many people really understand the working behind this product despite the simple design and their working principle.